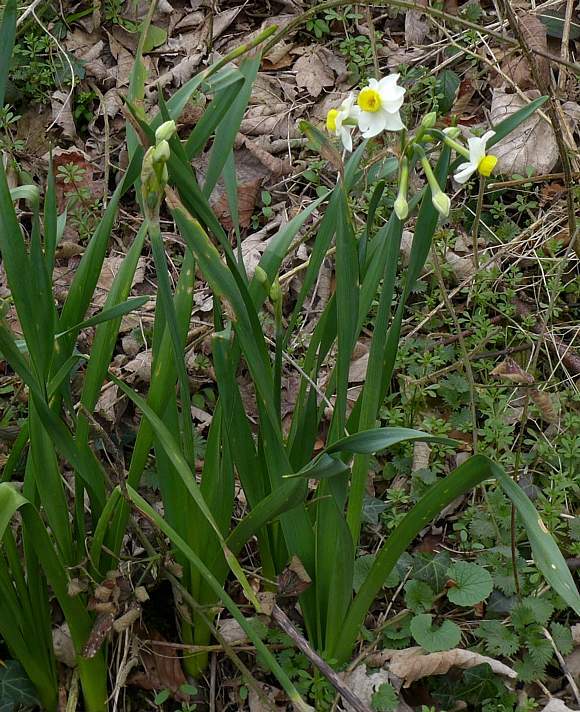 A few underground bulbs close together. 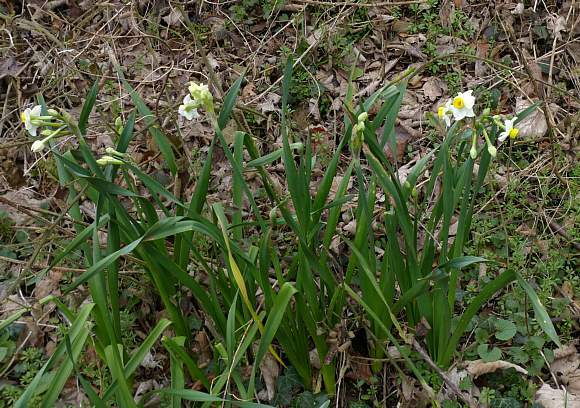 Unlike many Alliaceae family species, of which it is now thought to be a member, the bulb does not smell of onions or of garlic. Leaves 'flat' glaucous-green and between 5-15mm wide. 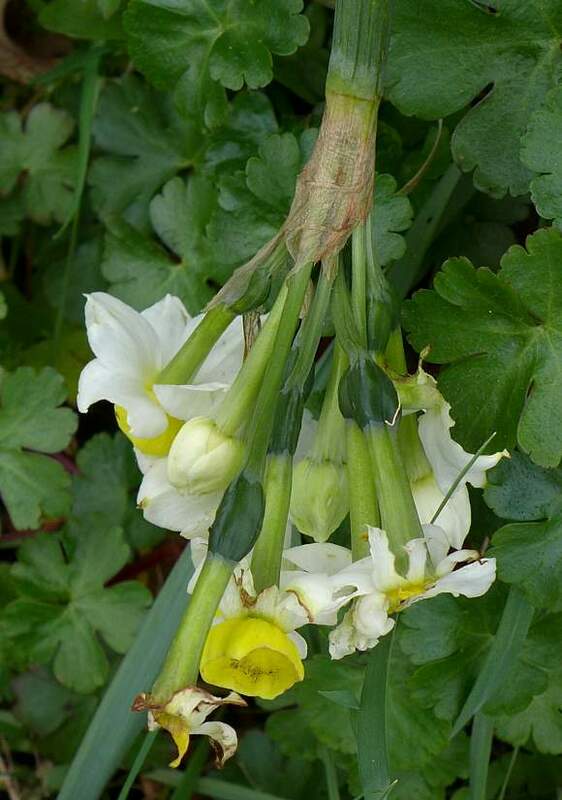 With between 3 to 8 (extremes 2-15) flowers emerging from near the top of a main stem. 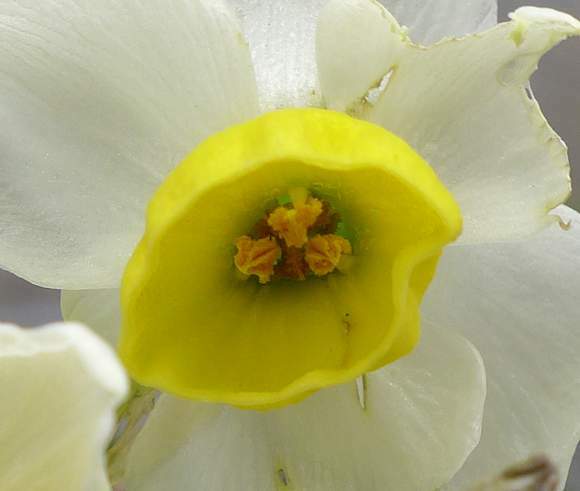 The six tepals/sepals are white (not orange) whilst the corona is yellow to deep yellow (not orange). The tepals are fanned out roughly in the same plane (i.e. not swept backwards). There is a paper-thin flap where the flower stalks emerge, just like those in the Alliaceae family [it IS in the Alliaceae family now). 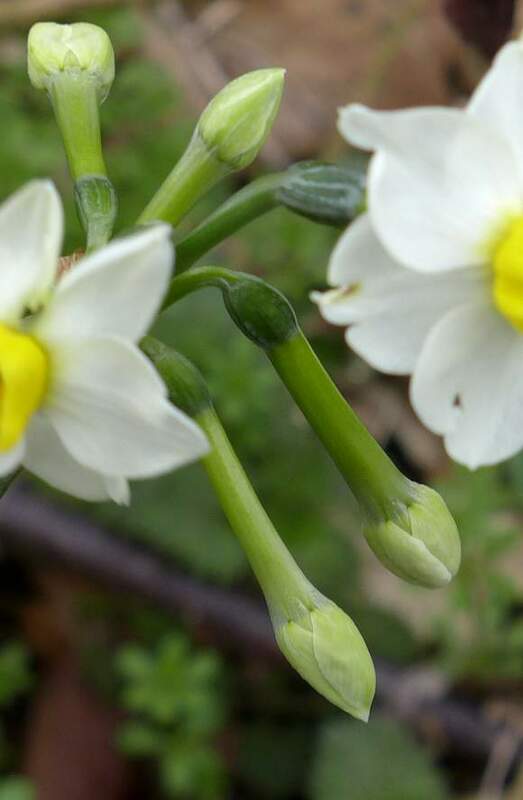 Where the flower stalks first emerge is a bulge at which point the rest of the stalk bends (like an elbow). 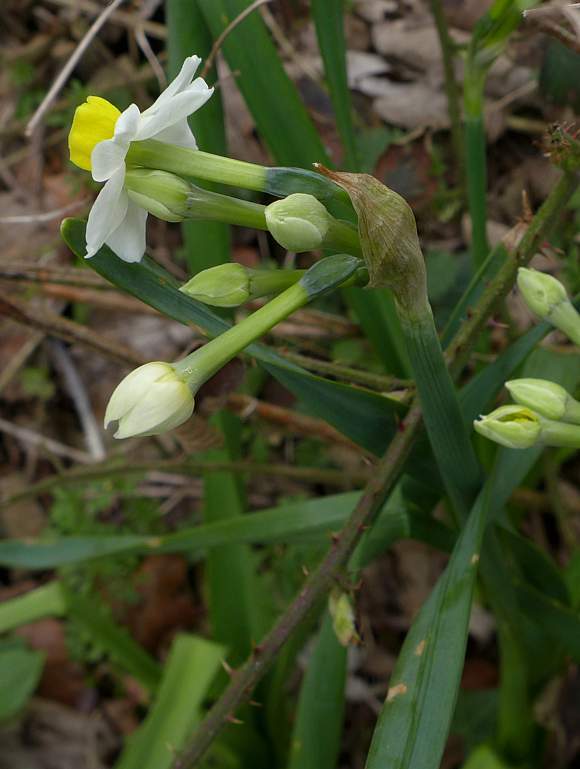 A long, narrower paler-green section of the stalk gives rise to a white un-opened flower bud. 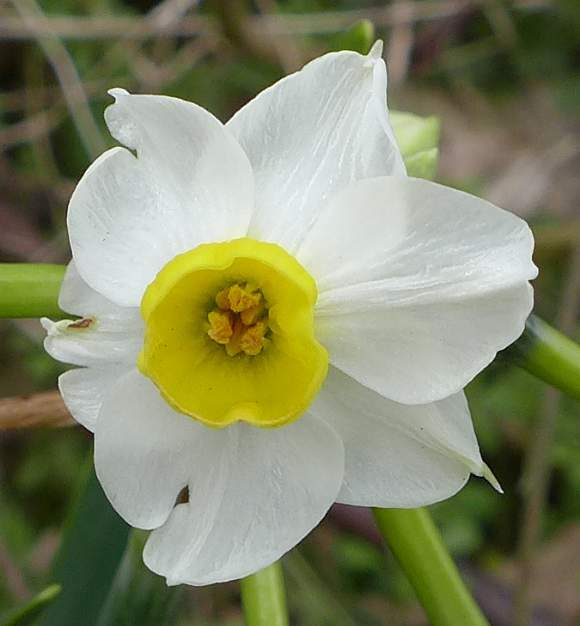 There are 3 inner white petals and 3 outer concolorous white sepals in the flower. 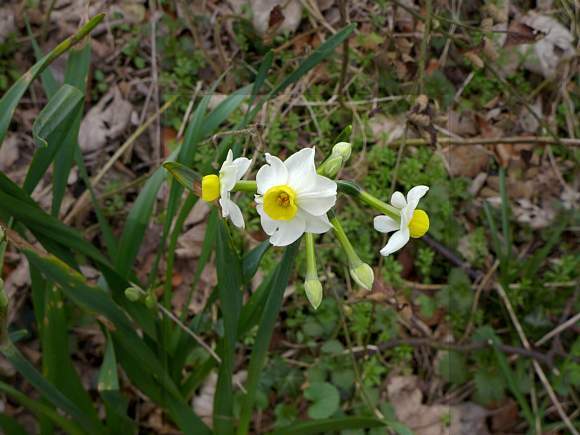 The corona is yellow to deep yellow and like a shallow cupped-bowl, between 3 to 6mm (long(?) or diameter(?) is not specified in Stace - if only he used the normal engineering abbreviation for diameter: φ - I suspect that it is the length, since the diameter is definitely more than 6mm across). Within the corona are 6 orange anthers, 3 slightly longer than the other three. The stigma has just one style but your Author cannot spot it here. 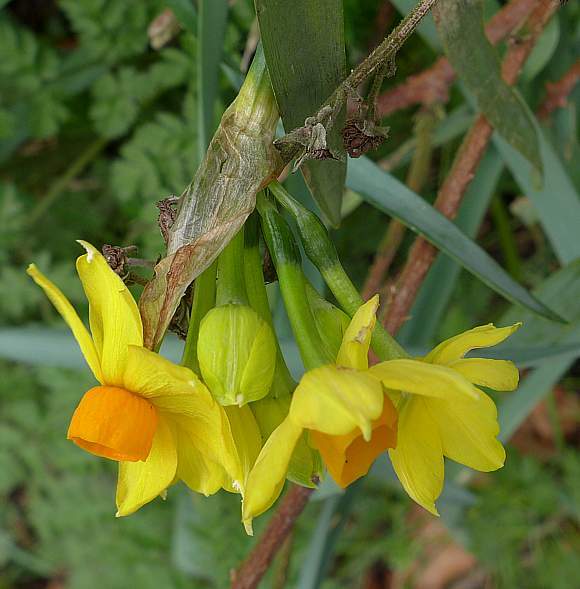 This specimen has about 10 flower stalks emerging from one stem, which is still within specification for Bunch-flowered Daffodil, but slightly above the normal range. 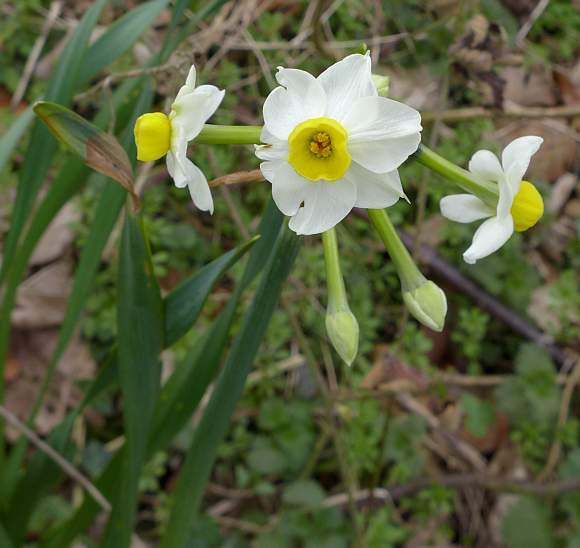 [The lobed leaves below are of a differing plant]. The dark-green bulge just after the bend is the ovary, which is inferior (meaning before/behind the tepals). 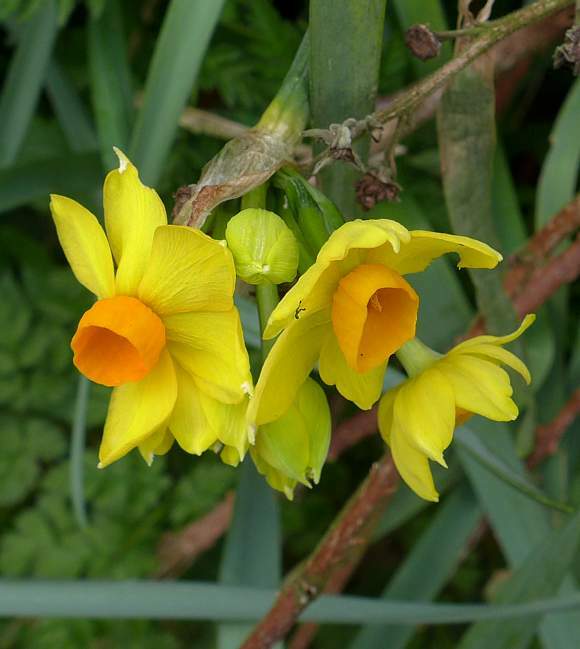 Those meeting the specification for Division 8 derivatives of Daffodils (i.e. 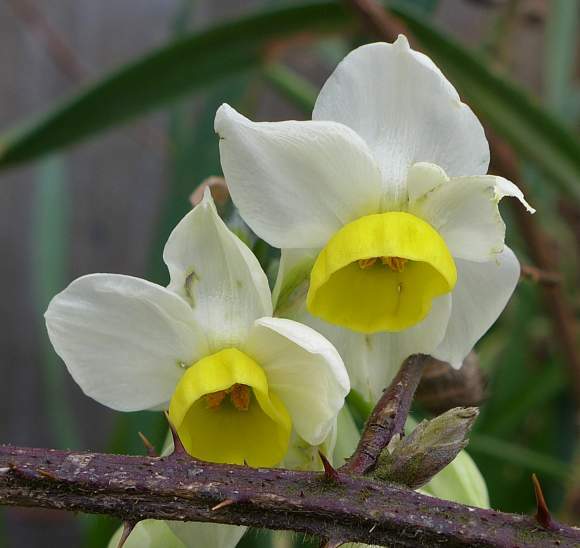 Tazetta species) but which have yellow tepals (as here) are also grown in gardens but unlike the white-tepalled variety have not been found growing in the wild. 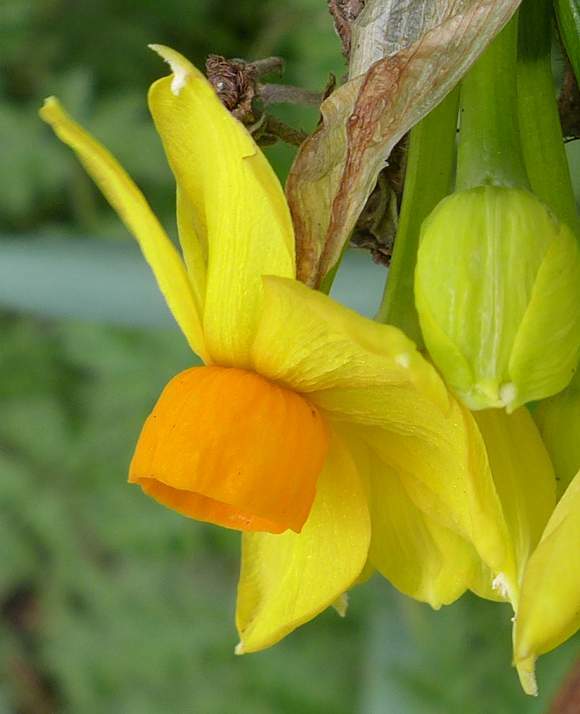 Bunch-flowered Daffodil is fragrant, with the major constituent in the essential oil being trans-Ocimene at 61% (but this seems to be for the cultivar Narcissus tazetta var. 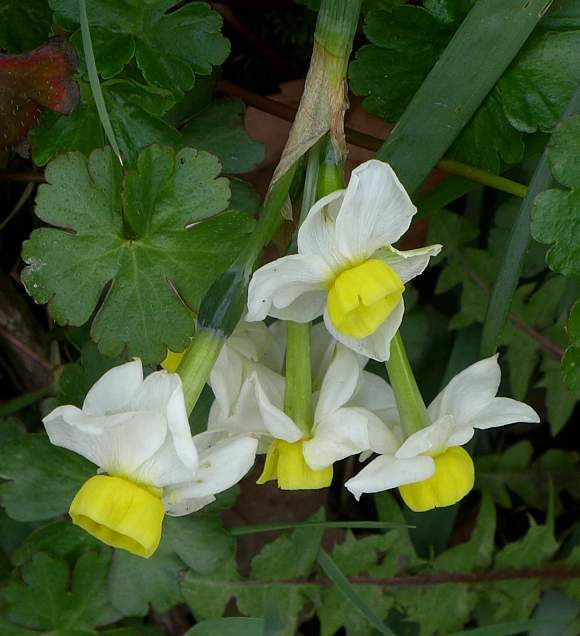 chinensis), whereas another source claims that Benzyl Acetate, Linalool and 1,8-Cineole are in the headspace of the true Narcissus tazetta ssp. tazetta.